Available in three affordable models delivering 5 ", 7" or 9 "angle accuracy, there is a DT-200 theodolite perfect for any job. The Topcon DT-200L Series resists any moisture or dust conditions in the field, allowing for a more productive day during inclement weather. Degree of protection against water is based on the standard IEC60529, whose definition is "water projected in powerful jets against the enclosure from any direction shall have no harmfuleffects." All models are compact and lightweight for easy portability and simple operation provides precise measurement infunctional and uncomplicated package. 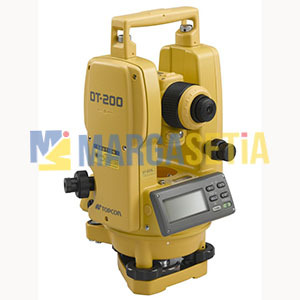 The DT-209L Topcon over 170h allows continuous measurement modeangle. This long battery life will eliminate the need for replacement batteries at work.